I decided to do some digging. The standard computer keyboard is arranged in a QWERTY pattern, so named because these letters comprise the top left-hand row of letter keys. This arrangement is actually quite inefficient. It turns out that only 32% of keystrokes for common English words use keys on the second row, while 52% of words use keys on the upper row. Remember, the second row is the ‘home row’, where experienced typists rest their fingers between words. Some very uncommonly used letters, such as J and K are both positioned on the home row. So why are the letters arranged so strangely? It turns out the keys were configured in such a way to accommodate the mechanics of old fashioned typewriters. Recall that each arm of a typewriter had a small letter on it that, when the corresponding key was pressed, was drawn up to strike an ink ribbon. This left an ink letter on the paper. When the keys were struck in rapid succession however, they would often jam together. So the QWERTY keyboard was laid out in such a way as to slow down the typist to avoid jamming the machine. In other words, the QWERTY keyboard was introduced to offset the mechanical limitations of the original typewriter. This got me thinking about how most Investment Advisors approach the investment process. Most Advisors still advocate for an archaic long-term investment approach called ‘Strategic Asset Allocation’, which suggests that an investor should decide on a basic allocation to stocks, bonds, and cash, and then stick with this allocation over the long-term, no matter what. With this approach, a growth investor that meets with an Advisor in January of 2000, at the peak of the technology bubble, will receive the same allocation to stocks as an investor who meets with his Advisor in March of 2009, at the bottom of the recent financial meltdown. Does it make sense that an Advisor should recommend the same allocation, say 70% to stocks, when markets are expensive and future returns are likely to be low (January 2000), as when markets are cheap and future returns are likely to be higher (March 2009)? That’s like recommending sandals, shorts and a t-shirt all year round in St. John’s. It makes sense sometimes, but certainly not all the time! Not surprisingly, the founding fathers of modern investing, like Warren Buffet’s mentor Benjamin Graham, did not adhere to this silly approach. Instead, they used simple but time-tested methods to tell if markets were cheap or expensive, and therefore if they offered the promise of strong or poor future returns. Their preferred method for valuing markets provides a very reliable estimate of future returns to stocks going back as far as 1870. Dr. Robert Shiller at Yale University makes the data to calculate this ratio available to the public, so it is a simple matter to demonstrate what this ratio has meant for inflation adjusted stock returns over time. In the chart below, we show that investors experience successively worse returns from stocks when they invest in increasingly expensive markets. For example, investors lucky enough to start investing in the 20% of months where markets are least expensive, such as late 1982, 1974, and 1932, received average returns of 11% per year over the following 10 years. However, investors that invested in the 20% of months where markets are most expensive, such as 1929, 1967, and 2000, experienced just 1.7% per year in returns over the following 10-years. Would you knowingly take on the risk of a 70% allocation to stocks if you expected to receive average returns of just 1.7% per year, or might you look for somewhere else to put your money to spare yourself the stress? Chart: 10-year returns following an investment in increasingly expensive markets. 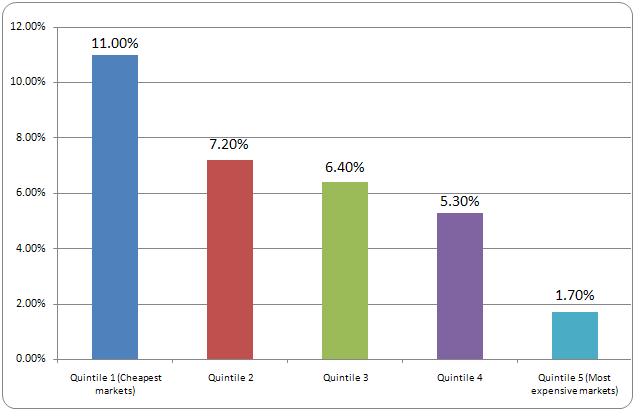 You might be wondering whether markets are currently cheap or expensive according to this model. Unfortunately, markets are currently expensive, with valuations in the top 25% of all months back to 1870. A more detailed analysis of the data suggests that the average expected return over the next 10 years is under 5% per year. Investors may want to consider whether they are being adequately compensated for assuming high levels of stock market risk given return expectations in the bottom 30% of all periods since 1870. Fortunately, investors need not be held hostage to a ‘Strategic Asset Allocation’ if they choose to follow some simple rules that identify whether it is favourable to own stocks, or whether the risks currently outweigh the rewards. We’ll be touching on these techniques, and the evidence that supports them, in future issues. In the meantime, those readers who would like an alternative to their QWERTY keyboard should investigate the Dvorak Simplified keyboard – Google it!